These are magnets we used to decorate our lockers. Empty the candies from the boxes. Insert a picture to show through the cellophane window. Glue the boxes closed and put magnetic tape on the back. Thanks to Linda at http://www.kinderteacher.com for this idea. Maureen Tumenas from Kinderkorner graciously offered to share her Valentine book on my website. Click on the links below to see the books. Print out the first two pages–copy them back to back. Print out the next 2 and copy them back to back. Stack this on top of the cover page. The last two pages are the middle of the book (again copy back to back) and stack on top. Fold the book in half and staple in the middle. 3. Valentines, Valentines, How many do I see? 4. Valentines, Valentines, Count them with me. 10. and some that are blue! 11. Valentines, Valentines, How many do I see? Count them with me! Give every child one “conversation” heart. Have them count the letters on the saying, then place a heart on the graph under the correct number. The children could put a sticker on the giraffe for every flashcard they could read. This is actually a tic-tac-toe game, but we used heart-shaped letters to build three letter words on it. The hearts and game can be found here. At this center we practiced reading our vocabulary words and by reading the heart words and putting them on magnetic hearts. At this center the children cut and glued on hearts to count by tens. 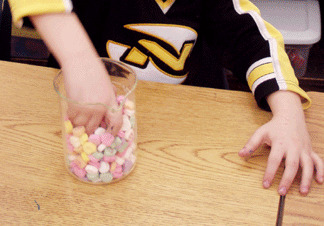 Use conversation hearts for an estimation activity. Get a copy of the Conversation Hearts Estimation Activity. Sort the hearts by color, place them on a graph and then color in the graph to show the results. These activity sheets came fromhttp://www.abcschoolhouse.com. We used hand sanitizer first and then grabbed a handful of hearts, counted them, recorded the number and compared the actual number to our estimates. The heart erasers could also be used on a double ten frame which is designed to help the students realize that 12 is made from one set of ten plus two more. The same heart erasers made an ABC pattern. We played teen number bingo and used M&Ms for markers. We recycled a gallon milk jug for our Valentine mailboxes. Cut the jugs above the handle and down the raised ridges as shown in the photos below. To make the animal body, use a 12″ x18″ piece of construction paper and cut into a shape has four “paws”. Cut an animal head from a 9″ x12″ piece of construction paper. Cut a large heart and write the name on it. To put it together, I staple the right arm and leg to the right side of the heart. Then I wrap the body around the jug and staple the other two paws to the other side of the heart. I secure it on to the jug with a few staples through the back and on each side. Then I place the head inside the jug and staple it to the back of the jug. It is best to have a “neck” piece below the face that extends down into the jug a few inches–this keeps the head from bending forward. Use lip stickers to play this game similar to Pin the Tail on the Donkey. I’m being sent to you. Great ideas! However, always check with parents about food allergies. Some kids may have a life-threatening food allergy to peanuts. I think Conversation Hearts may be manufactured in the same facility as peanuts and other major food allergens which can also present a danger to peanut allergic children. Maybe use an alternative candy that is peanut/nut-free to be on the safe side. Also some parents may not even be aware that tgrir child may have a food allergy/sensitivity.